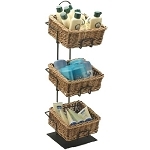 This beautiful 4 Basket Wicker Display rack will catch the attention of any shopper. 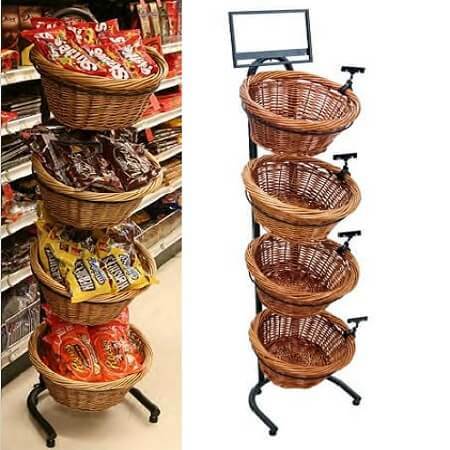 With the design of these baskets, your customers can easily see in a glance what is included in the baskets. With the warmth and beauty this freestanding floor fixture has to offer, you will have products flying out the door faster than you can keep the baskets filled. This wood basket rack can be used for everything from colorful fruits and veggies to yummy sweet treats and everything you can think of in between. Add to your buffet lines filled with individual boxes of cereal, fresh made bagels, coffee additives and so much more. Be creative when you use these natural appealing wicker baskets. Invest in your business and potentially gain more patrons and daily sales. 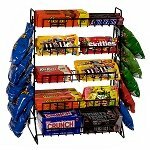 Make sure you get your four basket display stand today!